Boeing has conducted a test flight of the F-15 Silent Eagle demonstrator aircraft, in an effort to evaluate the performance of its recently integrated next-generation joint helmet mounted cueing system II/h (JHMCS II/h). Conducted at the company’s St. Louis facility, the test flight demonstrated the system’s enhancements and also gathered baseline data for the head-tracking technology, which required less than three months for installation on the multi-role jet fighter. Boeing JHMCS programme manager Greg Hardy said: "Both pilots who flew with the JHMCS II/h system immediately noticed that the helmet was more balanced and the smaller, lighter interface cable was less restrictive." Developed by Vision Systems International (VSI), the JHMCS II/h enables the pilot to make use of a new head-tracking technology and a display projected on to the helmet’s visor to aim sensors and weapons at targets, by looking at them. Offering an improved performance compared with previous JHMCSs, the system allows for an easy transition between day and night modes during flight, which greatly enhances mission flexibility. The new head-tracking technology can be easily maintained and requires less support equipment, while electronics improvements facilitates conduct of all processing within the helmet, eliminating the need for most aircraft-mounted equipment. "The system allows for an easy transition between day and night modes during flight, which greatly enhances mission flexibility." VSI president Phil King said: "The rapid validation of the maturity and effectiveness of several such technologies in this demonstration programme has shown that we can meet and exceed the performance baselines established by the extremely successful legacy JHMCS design, while also providing new capabilities and reducing cost to the customer." Boeing is proposing the F-15 Silent Eagle aircraft against Lockheed Martin’s F-35a joint strike fighter (JSF) and the Eurofighter Typhoon for the Republic of Korea Air Force’s (ROKAF) F-X III fighter competition. South Korea is planning to purchase a total of 60 aircraft to help replace its ageing fleet of McDonnell Douglas F-4 Phantom fighter jets. 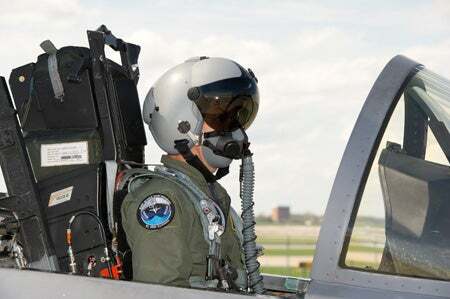 Image: A pilot wearing a JHMCS II/h equipped helmet during its validation at Boeing’s St. Louis facility in US. Photo: courtesy of Boeing.